As you probably know, Tricare covers one eye examination each year for active duty families or retirees using a US Family Health Plan, one eye exam every two years for retiree families on Tricare Prime, and doesn’t have a vision benefit for retiree families on Tricare Select (formerly Standard). It doesn’t cover contact lens fittings, anything special (like those retinal photographs that are recommended), or any contribution towards glasses or contacts. This means that families with vision needs may benefit from a separation vision insurance policy. Tricare vision coverage is NOT changing, at least not for now. My family has had a private vision policy through VSP and it saves us hundreds of dollars each year, but we have SIX people with more complex vision needs and max out our contact lens and/or eye glass benefit every single year. For vision plans, there is definitely a break-even point that depends on your family size and your vision needs. So, how do you decide if you want to purchase vision insurance, and how do you decide which plan is right for you? What Are Your Vision Insurance Options? Active duty and retiree families have will now have access to the FEDVIP offerings, or will continue to have the choice to purchase commercial vision insurance outside of the FEDVIP. Active duty families may also have access to vision insurance through a spouse’s employment, and retiree families may have access to vision insurance through a spouse’s employment or the retirees’ current employer. Each option may present different variables depending on your specific situation. The FEDVIP has a wide variety of plans, convenient payroll deduction, and has a self (translate: spouse), self plus one (translate: spouse plus one child), or self plus family (translate: spouse plus multiple children) option. One downside to the FEDVIP plans is that the active duty service member is not eligible for coverage. Employer-sponsored coverage may by subsidized by the employer, making it less expensive that FEDVIP or commercial plans. Your employer offerings can be amazing or they can be lousy – you really have to evaluate the plan you have available and compare it to your needs. Both the cost and who can be covered will vary by plan. Commercial coverage can be a popular option because it doesn’t require an open enrollment period or a qualifying life event – you purchase a year’s worth of coverage and then decide whether to renew each year. I even got coverage through VSP for care I was getting in a few days, instead of waiting for a new month to start. That was really helpful for us when I randomly decided to purchase it mid-year. Plus commercial coverage can cover the active duty service member, at no extra cost if you’re already purchasing family coverage. Premiums for coverage are based upon your family size and your location. For larger families, there are usually significant savings because there are usually three premium points: single, two person, and family (more than two persons.) The relative cost between the three levels varies by plan, but you don’t pay more if you have five, six, or more in your family. The VSP commercial insurance I have costs me around $400 per year for family coverage. FEDVIP plans range in costs from $70-80 per month for a single person to over $500 per month for a family. The difference depends on your location and the coverage of the plan. Vision insurance typically covers exams and some level of allowance towards contact lenses and or eyeglasses. There may be a co-pay or cost-share for these services. Vision insurance can also offer add-ons like scratch resistant coatings or transitional lenses for free or at a reduced cost. You may also get discounts on extras like that retinal photography, or vision surgery like Lasik. One thing to compare, if you wear contact lenses, is whether it gives you a cash allowance towards contact lenses or if it gives you a set number of boxes. If it is a set number of boxes, be sure your lenses are covered, and consider the actual cost of your lenses. Is Vision Insurance Worth It For Your Family? Whether vision insurance is a good value for you depends on your family size and your vision situation, particularly since the family premium does not continue to go up with more people. If you have a smaller family, or don’t spend money on upgraded services, vision insurance may not be right for you. Start by figuring out how many people you’ll be covering. Because of the way coverage is written, this is essential for figuring out which plan is right for you. Then, look at the individual plans and see how much they cover and/or you’ll pay for eye exams, glasses, contact lenses, and extra services. Then compare how much they’ll pay with the cost of the premiums. I know, it’d be easier if I could just tell you which plan is right for you. But I can’t – it’s too individual. But I can tell you how I did the math for my family. As I said before, our VSP policy costs us just under $400 per year, and it covers $150 per person towards glasses and contact lenses. I don’t even have to figure out all the added benefits, because $150 times 6 people is $900 – I’m saving $500 per year even if we don’t get a discount on add-ons and extra services. Do You Want The FEDVIP Vision Insurance, or Other Vision Insurance? If you have access to another employer-sponsored plan, that is almost always going to be a more affordable choice because there is usually some level of employer subsidy. If you’re choosing between the FEDVIP options or commercial insurance like VSP, it is very important to consider whether you want coverage for the service member. Active duty service members are not eligible for coverage under FEDVIP plans, but they are eligible for coverage under commercial policies like VSP. My husband is covered under our family’s VSP plan at no additional cost and it lets him get more stylish glasses than the Navy offerings. This is also great if your service member wears contact lenses – my plan covers $150 per year in contact lenses in lieu of glasses. If your service member would like additional eye glasses or contact lens coverage, you’re going to want an employer plan or a commercial policy. But if your service member doesn’t need vision coverage, then a FEDVIP policy might be better for you. When I first started researching vision insurance, I had four kids who needed exams (yesterday!) and there was no plan available through the military. I went to USAA and found that they have a relationship with VSP. After exploring the VSP plan, it sounded good, but I needed benefits to start sooner than the next month (which is how it works if you go through USAA.) So I went to VSP directly, and discovered that the plan was the exact same price, with the exact same coverage, and if I was willing to pay for the entire month I was in, I could have it effective in a few days. I’ve now compared my private VSP plan with the one offered by the FEDVIP program (it compares to the “high” option) and it is significantly cheaper for me to purchase it privately. I pay $399.48 per year for family coverage, and the same plan through the FEDVIP program would be $520.46 – that’s over $120 more! Plus, my private plan covers my kids until the day they turn 27 – which is a big difference from the care under the FEDVIP plan, where they lose coverage when they lose regular Tricare at 21 (or up to 23 when in school full-time.) Lastly, my husband is covered under our family VSP policy, so he can get nicer eyeglasses (and could use his benefits for contact lenses if he wanted to.) 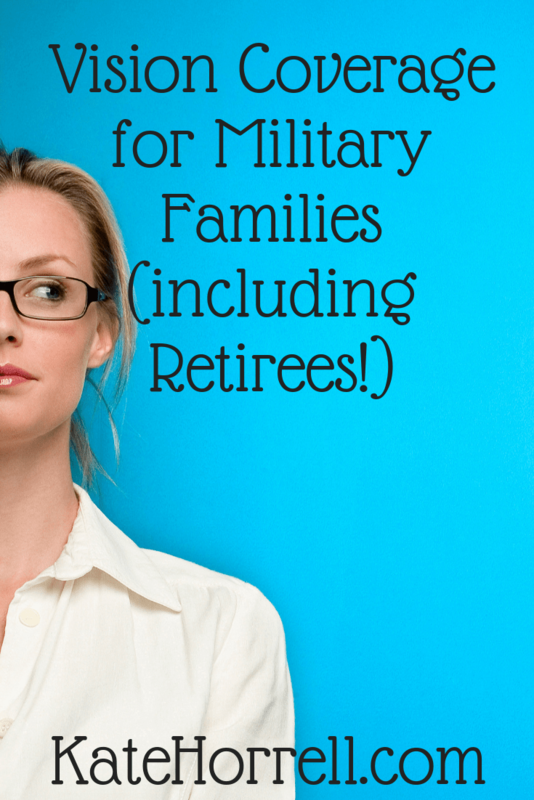 With the FEDVIP plan, the service member isn’t eligible for vision benefits! For military families, I honestly don’t know why anyone would go with any of the BENEFEDS plans unless their eye doctor or optician doesn’t take VSP. You can find more about the FEDVIP offerings at the Tricare Benefeds website: https://www.tricare.benefeds.com/InfoPortal/indexAction. There is an option to “compare” policies, but it really only scratches the surface of the plans. You really have to download the actual PDF brochure in order to do a proper comparison. Here’s a link to the VSP plan I purchased as an individual. It’s been good for us, and we’re sticking with it.